What is it like to be part of a well-loved yet revamped food show broadcast on prime time television? The story started over three months ago. I had just finished participating in a food science exam board as an external expert when I received a curious voicemail for a secretive new Channel 4 cookery series. I had been recommended by my friends at the Museum of Cambridge to guest star as a culinary history specialist! I have a background in food science and a deep interest in food history so this was a really intriguing request. When I called back Love Production, the company who films the show, I was given some details about this nameless yet influential program. 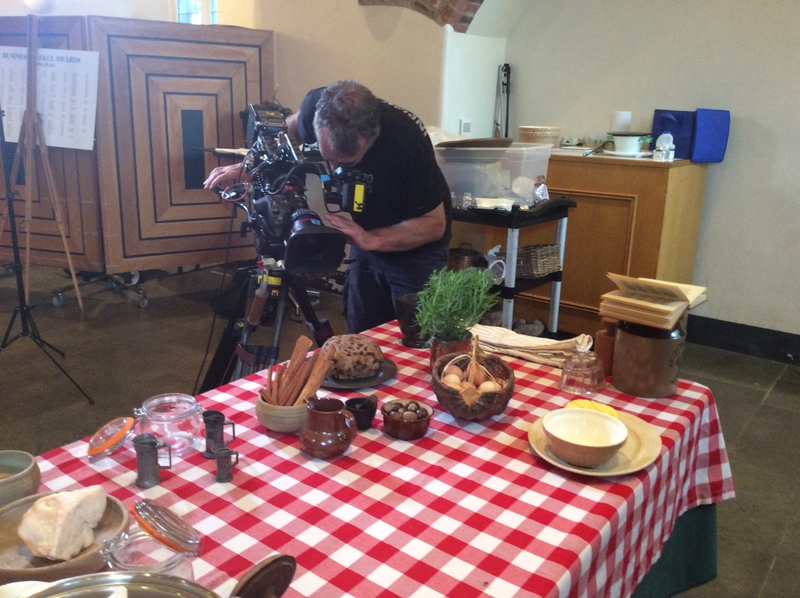 They wanted to film a piece in the ancient kitchens of the Museum of Cambridge. I was told it would involve cooking and talking about an old dessert recipe linked with Cambridge – my area of expertise. 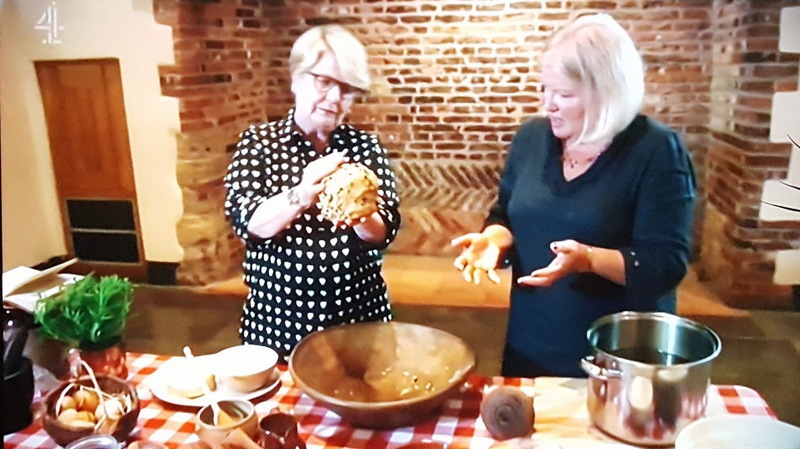 After a short correspondence they explained their need of a culinary historian to guide their presenter through a recipe for this 17th century dish on camera. They wanted to film about eight days later. This was very reasonable notice as when I have filmed for other broadcasts it is often with only two or three days notice. When I had confirmed my interest, before I could be given any more details, I also had to sign a non-disclosure agreement promising my secrecy until after broadcast.This is why, when the contestants participate in the summer for the Autumn broadcast, no news ever slips out! 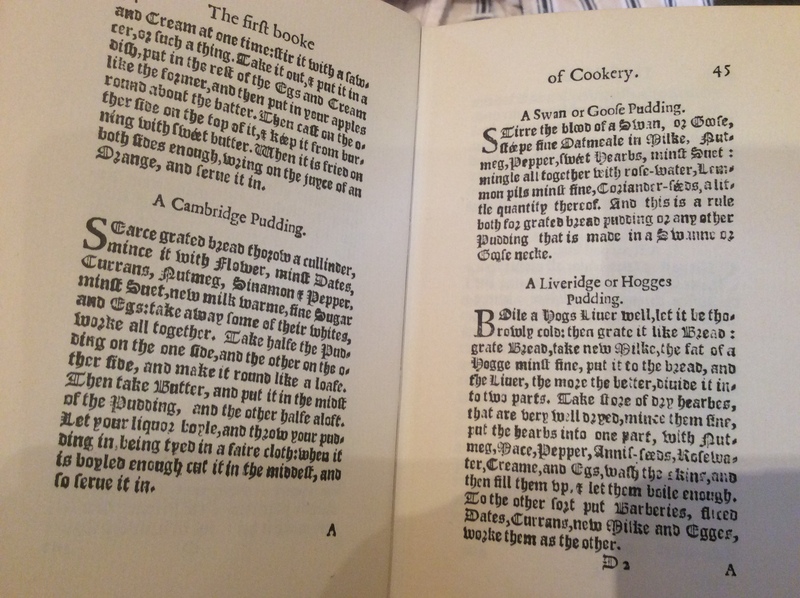 I needed to faithfully interpret the original 1615 recipe for Cambridge Pudding from “A New Booke of Cookerie” by John Murrell, that was available as a facimile of the 1638 edition. I was aware another expert was going to talk a little about suet pudding history. Hence I was keen to research more deeply about the pudding itself and the ingredients used as they would be shown on screen. Not much was available on line, so I turned to my 500 strong collection of cookery texts. Many of these are about food history and I also have some 17th and 18th century original books. 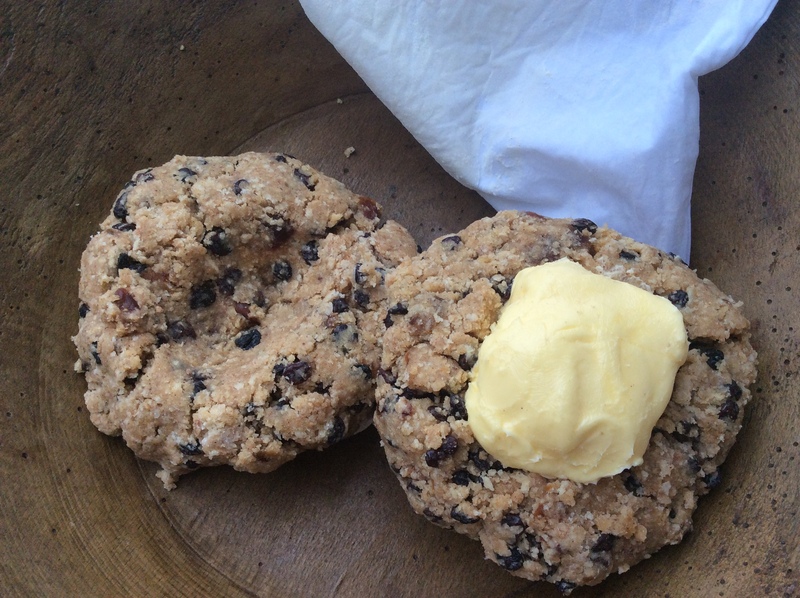 I used the Cambridge University Library for recipe and ingredients research as it was only a stones throw from the recipe’s origins. I was told I would be filming with the multi-talented presenter Sandi Toksvig and was delighted as it had also just been confirmed that Great British Bake Off was moving from BBC to Channel 4 for the 2017 series and who the new judges were. Sandi Toksvig had long been one of my media heroes as a comedian and presenter. 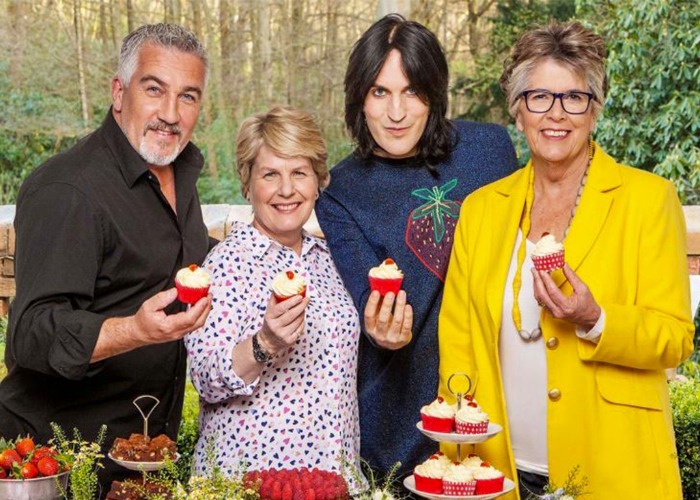 The other presenters and judges were Prue Leith, Paul Hollywood and Noel Fielding. The success of Great British Bake Off is legendary and has a fascinating background. To be asked to appear on such a prestigious and well known show was a real privilege as I could never apply as one of the 12,000 applicants due to my professional background. But what about the Cambridge Pudding? In creating the Cambridge Pudding the biggest challenge was working out what certain terms in the recipe meant and getting accurate measurements. Even the first word ‘sierce’ needed some guesswork. It meant sieve the breadcrumbs. To create over a kilo of breadcrumbs for the ingredients to be used and the finished dish was hard work. I tried using a sieve first which, though laborious, worked well but I eventually succumbed to a food processor. Hunting down original beef suet also proved interesting. After visiting two butchers I tracked some down to a third well known butcher near to Cambridge. Suet is the hard fat that is found round the kidneys. You might recognise it as one of the original ingredients of the traditional Christmas mince pie. In order to use the suet, the connective tissue needs removing and to be melted down or rendered and strained to clarify. I undertook the suet preparation myself then used it to complete the pudding. I made up the pudding shaped into a ball complete with spices, dates and a concealed pat of butter in the middle. This had the effect of moistening the texture whist it cooked. As the Cambridge Pudding was the first example of a pudding cloth being used, I decided that an Oxford pillowcase would be better than muslin and more authentic. Steaming, simmering and topping up with boiling water for the round pudding in a large saucepan for 6 hours was an exercise in patience! Ingredients also had to be weighed out for Sandi and myself to use. Spices were typical of the period and also included pepper, unusual for a sweet pudding. A subsequent post will discuss the history and ingredients of the pudding in more detail. We had originally been set to film in the museum and were going to use some of their original bowls and dishes. However, I have my own collection of pewter plates, wooden mixing bowl, antique measures and choppers and was keen to use them. 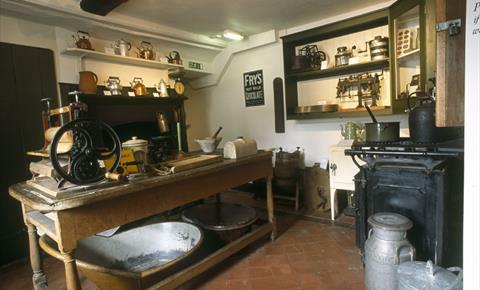 I then found out that filming was to take place in the Old Kitchen of Queens College. So collecting up my boxes, bowls, notes and all the ingredients I set off into the centre of Cambridge. The assistant director helped me unload and we went through to the filming location.There we were met by the director and she introduced me to Sandi Toksvig, the camera man, the junior assistant and Sandi’s assistant who also did her makeup. Lots of shots were taken of ingredients after the table was laid out with some of the props I had brought and other bits from the Bake Off collection. We only had one chance at making the pudding, so it was important to have a script to work from. The assistant director had written and planned out the scene so that camera still shots and filming were undertaken appropriately. Sandi and I had a dry run through and then started to make it together as I showed her what to do. We had great fun talking through each of the ingredients, a bit about their history and why they were used. We got our hands sticky forming the pudding and then adding the large lump of moistening butter into the middle. Using the technique of ‘here’s one I made earlier’ the pre-steamed pudding was placed on a pewter plate and carried into the Great Hall of Queens College. 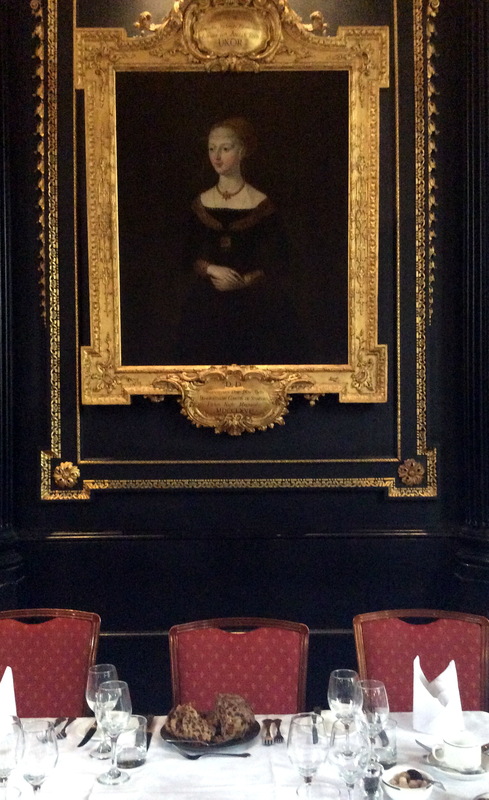 This was then displayed at the dinning hall’s top table with the portrait of Elizabeth Woodville looking down on it and then expertly sliced open by Sandi. But none of the lovely interior of the hall was shown. As there is often more than 30 minutes’ worth of filming, the editor and producer takes an executive decision about timing and what looks best. So sadly much of what gets recorded lands up on the cutting room floor – although now it would be the delete edit box. But so is life and 30 seconds worth of fame is better than none at all. It was a wonderful experience and when friends say things such as ‘the Queen of Baking’ and ‘a star is born’ it makes the day a good validation for my many years of food teaching, research and lecturing experience.